We’ve been making free twitch overlays, alerts, and stream widgets for a few years and decided it’s about time we made a one-stop post to help you find what you want quickly and easily. Over time we’re seen a lot of new users coming to our site and we wanted to make sure they knew the full scope of free twitch overlays, panels, and general resources that we offer. While Twitch is definitely the most popular streaming platform that we support, almost all of the items listed here will work with Facebook, YouTube Gaming, Mixer, and more! Our goal with our overlays is to make them modular. Meaning you can use the bits and pieces that you want to. This also will allow you to use things like the color correction source in OBS Studio and Streamlabs OBS to make it fit your stream’s theme. While some items may have a “suggested price” on them, just enter in “0” for the price to get them for free. Below you’ll find a list of free overlays and scene designs. While some may have a “suggested” price, you can enter in “0” to receive the item for free. Christmas Overlays and Widgets – A free Christmas themed overlay pack with widgets! Stone Fire Nerfed – An overlay designed specifically for MOBA players, but includes files to work in any stream design. Free Scene Maker – Create your own scene designs with our easy to use scene maker. Call of Duty Themed Overlay -Originally designed for Call of Duty: Infinite Warfare. Create Your Own Overlay – Create your own simple overlay. No Man’s Sky (Sci-Fi) Themed Overlay – Originally designed for No Man’s Sky, this sci-fi inspired overlay is free for all! Overwatch Overlay – A static version of our popular Animated Overwatch overlay. Halloween Overlay – A free Halloween themed overlay. Ready to go? We’ve included a section in our shop specifically for free resources. However, this post will detail more about each pack and the extras they include. While we offer a lot of free resources our shop contains premium items that you can purchase and use on your stream as well. The overlays below are “lite” versions of full packages that we’ve made. Typically these are static (or non-animated) overlays. But, we do our best to pack all that you would need to create a full stream design. In fact, most of them come with free Twitch panels, icons, and a bit more. This overlay was create to give off a clean, professional, and unique look. You can easily adapt this design to most games and applications, making it perfect for those of you that do IRL streams or variety gaming. It works with all major streaming software. When downloading, make sure to select the “lite version” option. A lot of the packs listed in this post will have more than just free overlays included. 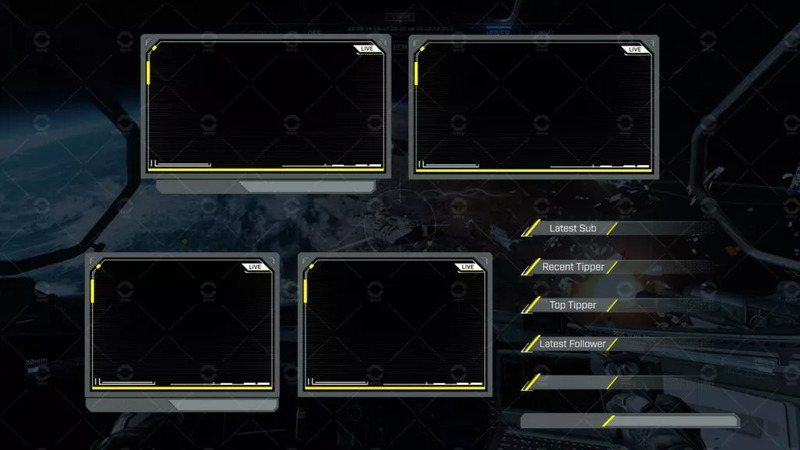 In the case of Clearview you’ll also get access to icon designs, Twitch panels, and stinger transitions. This pack is at the top of our list for a reason! Listen, we love “clean and modern” as much as the next person, but sometimes you have to change it up. Stone Fire was created for those that want more theme and texture in their overlay designs. This free Twitch overlay includes webcam frames, supporter sections, and Twitch panels. Components of the overlay pack are specifically made for LoL and DotA 2 streamers. We did our best to design it in a way to let you show as much of the action as possible, while still showing the information on your stream that you need to. This is one of our first free Twitch overlays that we designed and remains one of our favorites. This pack includes multiple webcam frames, support panel layouts, and a HUD that you can align to the bottom of your stream. The only difference between this pack and the full version, is that it is non-animated. Did you know we have a free to use Overwatch panel maker? Looking for Twitch panels to compliment your new overlay? Look no further, our free to use Overwatch Twitch panel maker let’s you customize and download Twitch panels to fit the Overwatch design aesthetic. While this overlay was originally designed for Call of Duty: Infinite Warfare, we think it still holds up today. It features multiple webcam layouts and a supporter section design that lets you decide if you’d like them to be stacked vertically or horizontally. A great option for new streamers. One of our most frequently asked question is: how do I get the usernames to update automatically on my overlay? To add these dynamic “labels” to your scenes, you’ll first need to add text sources. We recommend entering in some demo text so that you can position and size your text properly. Please note that’s best to change the font size inside of the text source properties, and not drag to scale (this can cause blurry text). Next, you’ll need to download and run a program that updates text files dynamically as you get new users, tips, subscribers, etc. A good place to start is the program Stream Labels for StreamLabs. When you install this program, it will create various text files on your computer that you can then sync inside of OBS Studio (or your streaming software). In the text source properties enable “read from file”. Here, you will “browse” to find a file that you want read and synced inside of your streaming software. Choose the appropriate file, and then it will be connected and updated automatically. One of the biggest video game disappointments turned out to inspire one of our favorite overlays. While this is a “No Man’s Sky” overlay, don’t let the name fool you, this overlay was designed with a sci-fi feel, and a clean look that can work on any stream design. With the announcement of No Man’s Sky Next, this overlay should keep your stream looking great for years to come! We get a lot of questions about looping popups, so let me explain the easiest way I’ve found to make these happen. First, design something cool in After Effects or similar. Second, export that as a WebM. Finally, create a local HTML page that plays that WebM on loop with a bit of delay. If you’re reading this post, it’s likely you’re interested in creating stream designs yourself. If you can pull off the steps for creating a social media popup, then you can make everything else listed in this blog post. In my opinion it’d be a solid place to start and to challenge yourself a bit. Unfortunately not all of the best free Twitch Overlays are on our website… but we’re working on it! However, we have some other options that you can check out on our sister-site Twitch Temple. We’ve included a wide variety of design aesthetics. From sci-fi and clean/modern overlays to textured and themed. Let us know if you think there’s a design we need to add next! We’re always looking to improve what we have on our site and your suggestions are what help us the most.